Is It Safe to Dye My Hair If I Have Hair Loss? Any person can suffer from hair loss at any age, and for a variety of reasons. It can happen due to different conditions such as alopecia, treatments for cancer or even just aging. However, it can be a distressing condition to find your hair is thinning or falling out! You definitely don’t want to do anything to exacerbate the problem, but if you colour your hair you might be wondering if that is making the problem worse. Here are a few tips on what to do if you dye your hair and are experiencing hair loss. Many men and women of all ages, use hair dye to change or enhance their natural hair colour. Hair dye uses chemicals to bond colorants to the hair, both internally and externally, so the hair must actually be penetrated by the chemicals. Dying your hair darker is less damaging than dying it lighter or bleaching it, but either way it can cause mild damage. Colouring your hair shouldn’t cause hair loss because new hair growth occurs below the skin’s surface, but it can cause hair to appear thinner. The only part of your hair that is alive is under your scalp, which is why you should try to avoid slathering hair dye on your scalp. If the hair bulb is affected by chemicals or hormones in the blood, it can result in hair loss. This means that the hair bulb needs to be fed properly via the bloodstream, or hair growth will slow down or stop. If you want to boost hair growth, it’s important to take care of the part of the hair beneath the skin as well as the parts you can see. Many hair dye products contain chemicals that, if misused or overused, can result in damage to your hair follicles or your scalp. It’s always best to use safe, natural hair dye products to color your hair so that you don’t have to worry about damaging the hair or hair bulb. Be sure to avoid products that have harmful ingredients such as resorcinol, ammonia, persulfates, hydrogen peroxide, lead acetate or 4-ABP. Products with certified organic ingredients that come from natural sources will be much gentler on your hair and leave you with beautiful colour still. 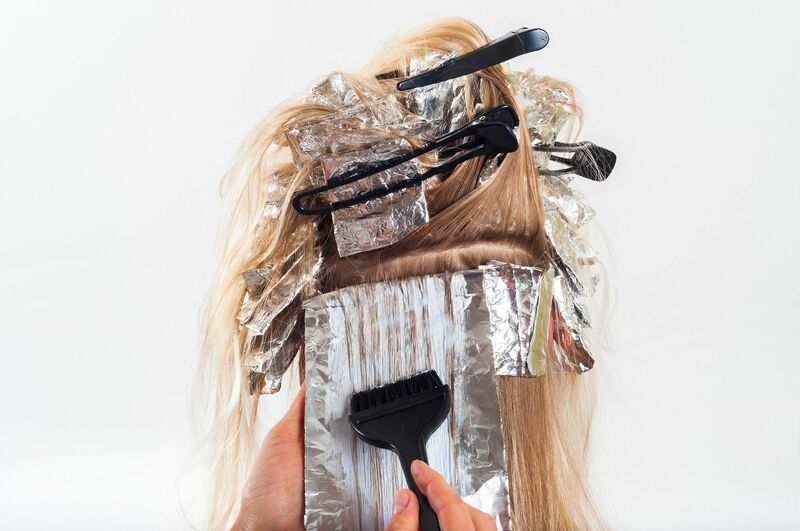 Whether you’ve been coloring your hair for a while or are new to the game, it’s important to take a few steps to maintain and repair dyed hair to keep it looking healthy and shiny. It’s a good idea to use a healthy, organic shampoo that isn’t packed with harmful chemicals in order to accentuate the natural luster of your hair. You can also try using a natural hair mask once a week. Try blending avocado, coconut oil and honey together and applying it to your hair for 20 minutes to restore some of its natural sheen. It’s also important to get regular cuts to trim off the split ends so your hair looks fresh and healthy. Remember: washing your hair more often isn’t always the solution. Products like dry shampoo can help you maintain fresh hair without a daily wash. If you dye your hair frequently and love a new look for your tresses each season, be sure you’ve built a healthy foundation for your hair to thrive in, so it can handle the dyes you place on it and can achieve the desired colour and look you want. A healthy scalp fosters strong healthy hair, check out our Tricovel products to help you grow stronger, thicker hair and prevent thinning, damaged hair.